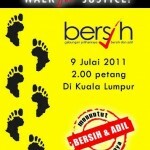 bersih 2.0 rally – I WAS THERE!! – welcome! 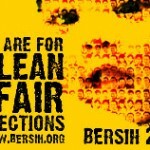 You are here: Home › election › bersih 2.0 rally – I WAS THERE!! yes! proud to say i was among the 50,000 odd crowd who came together to march for free and fair election, on 9 july, a historic day indeed. ok let me begin from the beginning (eh? sure lah!) – uh oh this signal a long-winded story coming up. well of course, it was a most exciting day so plenty to tell – my first hand experience story. well we took the lrt at bangsar to masjid jamek. as it is still early, the place was relatively quiet. there were some policemen here and there. as it was still early, we decided to go to some shopping malls and loiter around first. we went to low yat plaza first but just sat down and waited for some updates (sms from friends and twitter updates from stanley’s phone). then we went to subang parade and lot 10, where we met br. aloysius and his cousins. finally howie contacted his son and we decided to meet his son at the pavillion shopping mall. had some makan there. as we heard from aloysius that there was a group gathered at chinatown, we decided to go there to join the group. took a taxi there. yes when we reached there, there was a group there who was chanting. then they decided to march, so we followed of course. marching and chanting, we stop in front of menara maybank, where i notice there was someone giving a speech (later found out from online news, it was hatta ismail from PAS). a crowd was already there, and we from chinatown joined them. then later i notice that another crowd that i think came from puduraya direction joined us too. there were clearly as many as 10,000 people there then! we were there for quite a long time, listening to the speeches and chanting away. i managed to record some of the chanting. (maybe will put up the chanting later). at that time, when we stop in front of menara maybank, howie got seperated from stanley and i. stanley and i were still together… but not for long, when stanley went forward to take photos. i did not followed him. then suddenly i heard someone shouted “ok. get ready. the water canon is coming.” well, while i was standing there listening to the speeched, i notice two escalators in front of menara maybank, and i was already telling myself if the water canon come, i’ll run up the escalator. (all along the escalators, there were people standing). the escalators reach to the huge open-air lobby of menara maybank. true enough when i spy the water canon, i quickly ran up the escalator… but i was not the only one who thought of that. many others also ran up the escalator. while i was about halfway, suddenly the people began to shout and those who went up, were seen rushing down. it was near panic… some people rushing up and some rushing down. i found out why they were rushing down… because tear gas was fired which reached the lobby of menara maybank! some people who came down the escalator, jumped over the side of the escalator where there is a low wall and jumped again to the other side. seeing the tear gas coming, i thought of jumping too but i scared i can’t jumped over the wall, so i decided to go up anyway. by the time i was up there (at the lobby), the tear gas already reached the top and i was hit with it. luckily, it was the ‘tail-end’ of the gas, and luckily the lobby was high up, so i was not hit by it full impact. still my eyes started to smart. there were about 20 of us there at that time. i quickly took out my packet of salt and my small towel and water bottle (see, i was prepared!). put some salt in my mouth and pour the water onto the towel to wet my face. i notice one young man was crawling on the floor – i think he got the full impact of the tear gas. his friend then, seeing me with the salt, came to borrow the salt from me. er… well… took the salt lah… cannot borrow of course. of course i gave it to him. i notice though there was another man going around shouting “garam! garam!” (salt! salt!). well i then remain at the lobby for quite some time. some people left, while others still hang around. we all stood at the balcony to peak down. 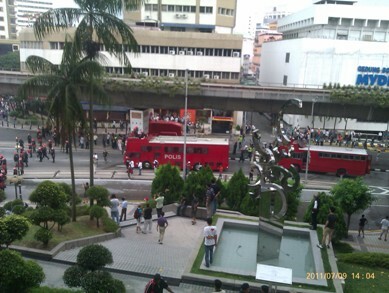 we notice the police truck parked right in front of the maybank building (where we were)! and many police standing in front of the truck (see picture). it was like they cordoned off the whole area. several people later left until there were only about 4 or 5 of us. i called stanley to find out where he was. he said he was at puduraya and they were trapped by the police on both sides! i told stanley i am still at menara maybank and he advised me to remain there for some time, not to go down, as he fear the police might arrest me if i go down. so i waited. it was about 2.00pm that time i think. then suddenly i heard the firing of tear gas again… this time it was aimed to the direction of puduraya. a few minutes later, it suddenly started to rain heavy! god’s blessing! the rain at least washed away some of the tear gas. later on, i found out from howie that when the water canon and tear gas came at menara maybank, the crowd split into two – one headed to puduraya (where stanley went) and the other headed to somewhere jalan sultan (where howie went). howie said i should have followed the crowd to move away and not run away by myself. haha. and was he or stanley who also said that running into maybank lobby, give more chance for the police to arrest me (if the police went up there) as there is no way to escape. while it was raining, i still remain in maybank. there were seats there. i waited until the rain stopped but decided not to go down yet until i find out where stanley and howie were. there were about 8 people around. suddenly though, the lady guard of maybank came to tell us to leave the place. she was quite polite though saying that earlier she gave us chance to come in here to get away from the water canon/tear gas/police but now that everything’s seems to be gone, we should leave the premise. so i leave menara maybank and hang around the bus stop. i called stanley to find out where he was and he was still at puduraya and he said i can’t go there since they were surrounded both sides by police. i then called howie and he said he was at jalan hang jebat, so i decided to make the way there, though i have no idea where it was! while i was walking towards ancasa hotel, i notice an ambulance arriving at a scene near the hotel and many people were there surrounding someone. so i became a busybody and joined in the crowd to see what happened. notice a woman was lying on the floor and lots of photographers were taking photos of her. i also took some photos of her. then i walked towards jalan sultan… and looking far ahead, i notice a crowd there, so i decided to walk down to where the crowd was. when i reached the intersection where the traffic light was, i called howie and asked where he was, and telling him where i was… when he was just right in front of me! haha. so i joined him and all the others, who were hanging around there. howie had a field day borrowing his bersih head-band to people to take photos! it was there that i met ee chia from SABM and maslinda from CIJ. after hanging around there sometime, the group decided to march to the stadium. so we all followed – marching and chanting. as we reached the end of the road, we stopped. we waited a while. then we notice another group was marching heading towards us. our group shouted in joy and waved to them to quick come join us. so now there was a bigger group of us and we continue marching to stadium merdeka. of course we were not allowed to enter stadium merdeka so we just stood there. 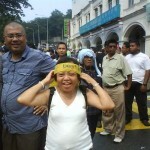 howie again, was ‘canvasing’ people to use his bersih headband to take photos. “for remembrance” he said. we also took some other photos. it was like a carnival at that time, where we chatted to strangers and took photo with or at strangers. at 4.00pm, howie received a sms in which he was told the organising committee asked us to disperse. well the planned rally was actually from 2.00pm to 4.00pm. so being the good, peaceful, obedient people we were, we did disperse. howie and a few others shouted “bersurai! bersurai sekerang!” and everyone dispersed and went on their own here and there. howie and i decided to go to the pasar seni LRT to take the LRT back to bangsar where our car was. while hanging around near the LRT, i ran into nathaniel tan, who, i’m surprised can still recognise me (we met many years ago during the first BUM). then the other person i ran into (same place) was my state assemblyman, YB sim tze tzin. he was the one who called out to me. we found out that the LRT had been shut down… so how?? howie said we can walk back to bangsar. what?? goodness! i told him it would be very far to walk to bangsar. crazy! he was saying not far lah but i said no lah, better we find some alternative first. i had been doing so much walking and standing already that i don’t think i will have the energy to walk to bangsar!! well we decided to take the KTM commuter train to KL sentral. so we walked there. then howie called stanley and found out stanley was at burger king in KL sentral. so just nice… for us to the commuter train to KL sentral to meet up with stanley. 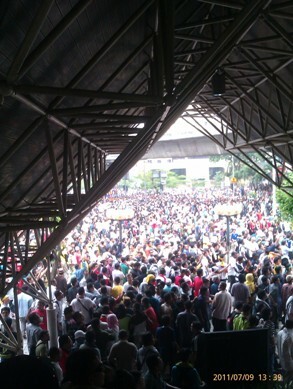 there were so many people at the KTM station. it was here that we ran into a couple of malay ladies, and howie flashed his headband again to ask them to take a photo. well i too joined these two ladies to take the photo (see picture). 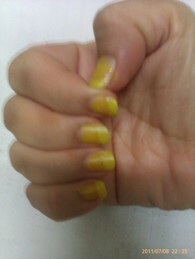 the lady on my right, seeing my yellow nails, exclaimed “kuku tangan you kuning.” i told her well since i can’t wear yellow t-shirt, i figure to have something yellow, so best way was to paint my nails yellow. haha. she then replied “semangat ah you!”. you see all of us were there with only one aim – to call for free and fair election, to made our eight demands, so although we were all strangers, we smiled at everyone and we simply talk to each other although not knowing each other. there was a long queue at the ticket counter. seemed that many of the protesters too wanted to use the commuter train. we had to wait about 15 mins for the train to arrive. when it arrived. everybody was pushing each other to rush in. the train was sardine-packed! luckily it was only one station away to KL sentral. 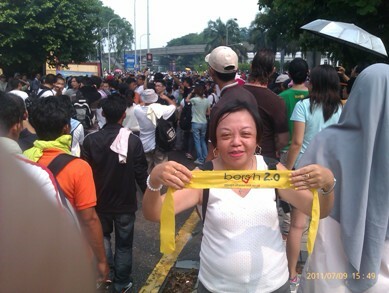 of course the majority of the crowd was us – the bersih protesters. some even cried out “bersih!” inside the train. we met up with stanley at burger king and decided to eat something there too until 6.00pm when the LRT opened for service (at that time, it was about 5.20pm). surprise… a group of people who came to the table next to us, we suddenly found out they were all from penang too. well first of all we found out (by hunch) that they were at the bersih rally too. 2 elderly ladies in tudung and 2 elderly men and one young man. after 6.00pm we went to take the LRT back to bangsar to get our car. before that, howie said he need to change as he was all wet so we decided to go to malaysiakini’s office again. i was hoping that someone i knew (maran, shufiyan, sean) would be there… but i was surprised instead to run into janet! didn’t expect to see her there. we talked a little while howie went to the wash-room. when we get our car to want to leave for penang, stanley suggested why not we go to the jinjang police station to give our support to those who were arrested. do you know what? when we reached the police station at jinjang, we were shocked to see police guarding the entrance and barb wire was placed there. ya allah! they were so scared of us bersih supporters being present eh!! found out the other detainees were at somewhere cheras. since cheras is quite far away, we decided not to go, so instead we started to head home to penang. it was around 7.00pm. i’m glad that i was at the rally. it was an awesome, exciting day to be among the crowd… to first time experience tear gas! haha! i had many friends who called up or left note on facebook that they were proud of me for being present at the rally. well, i am proud of myself too… proud that i care about to make a stand for free and fair election. one thing that strike me most during the rally was how friendly everyone was. i mean strangers. though we don’t know each other, we smile at each other and we talk to each other. it was as though we were one big family – the malaysian family! (not forget we look out for one another. e.g sharing salt, helping people to ‘escape’). oh yeah! 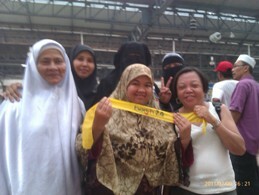 9 july 2011 will be a day i will not forget for a long long time. 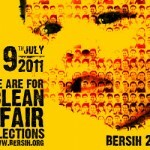 9 july 2011 was the day i witnessed real MALAYSIANS coming together for one single common cause as a FAMILY.